More than 30 crore Indians are using Whatsapp right now in India, and it has become a major source of news for all of them. In fact, on some levels, Whatsapp as a news source is bigger than any news channel or social media. So big and so important, that people are ready to kill and lynch others based on Whatsapp forwards. Govt. has repeatedly pleaded, requested and ordered Whatsapp to stop the menace of fake news, and to control the spread of malicious content. 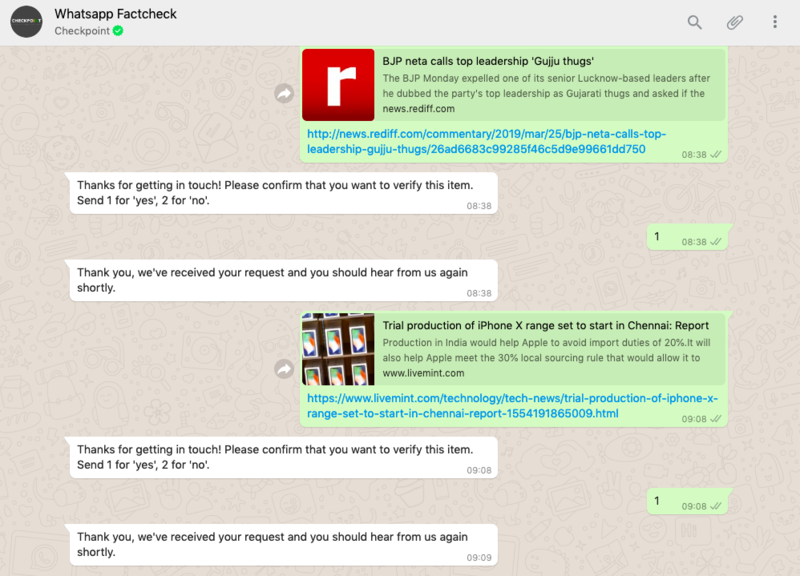 Now, just days ahead of Lok Sabha Elections 2019, Whatsapp has launched a fact-checking service for all, which claims to help fight this menace of fake news, and ensure that everyone accesses only real news. This is a great service, but, will it work? Whatsapp’s Face Checking Service: How Will It Work? Step 3: This automated service will ask you whether you really want to check the facts of this news? Press 1 for Yes, and Press 2 for No. Step 4: A confirmation message will be delivered, and in some time, the service will inform you if that news is correct, genuine or not. This service can support Hindi, Telugu, Bengali and Malayalam. We tried this service for two news, and we didn’t get any reply about the authenticity of the news in 30 minutes. We will update this blog when we receive a reply. Whatsapp’s Face Checking Service: This Will Create A Database? This free service has been created by a media-skilling startup called PROTO, and Whatsapp has collaborated with them, for the same. Based on the messages forwarded to them, PROTO and Whatsapp will create a massive database of news and information, which will help them to filter out the fake messages quickly. Whatsapp has also partnered with companies such as Dig Deep Media and Meedan, which have worked in this fact-checking mission before, in other countries. Meedan had earlier used this platform called ‘Check’ to curb fake news propaganda in France and Mexico, during elections. Earlier, Whatsapp had announced a reward of $50,000 to anyone who can devise a fact-checking mechanism on their platform.